In this entertainment series, a group of Bigfoot enthusiasts follows leads and eyewitness reports into the woods in search of the elusive creature. Will they find, once and for all, indisputable evidence that Bigfoot actually exists? The series airs on the Animal Planet cable network. The team of investigators returns for the 100th and final episode! In a two-hour Monster Week special, the team travels to Willow Creek California to help celebrate the 50th Anniversary of the most famous piece of Bigfoot footage, the Patterson Gimlin film. The discovery of a new copy of the film brings forth the biggest Bigfoot discovery in decades, showing the clearest image of the creature in 50 years. Immediately following is a one-hour special that features the Finding Bigfoot investigators and crew as they share their own stories and experiences together which spans a decade. Go behind the scenes in the search for America's favorite monster. Spanning over 9 years and 100 episodes, this special hour with the cast and the crew of Finding Bigfoot shows off never seen before footage and highlights the best of Bigfoot. The crew visits Iowa to examine Yellow River State Forest's history of reports. The squad visits Wisconsin for the first time on the trail of recent bigfoot activity, requesting help from locals to examine reports. The group heads to Remer, Minn., to look into the little town's claim to be the Home of Bigfoot; as proof continues to grow, the crew pursues an exciting new lead on a sighting and a footprint on their last investigation. The quest for bigfoot leads the team to Southern California, where reports have been raging; they zone in on the canyons of Deep Creek, requesting the assistance of an LA local for a night investigation that gives proof that sasquatches live there. A bigfoot festival attracts the team to a city just outside of Nashville, but it's a bizarre revelation that encourages the team to invite a country star to come squatching with them. She just might be the bait they need to lure in a bigfoot! The crew invites a group of skeptics in Arkansas to come with them on an excursion; the skeptics offer a big bounty for proof of bigfoot's existence. The crew goes back to the Four Corners of America to discover previous witnesses have been bombarded by recent activity; a wide lookout in all four states leads to their most intricate strategy so far in hopes of capturing footage of a bigfoot. The crew takes a special trip to Hawaii, wishing to say aloha to the islands' little foot: the Menehune; taking their exploration across the beautiful Hawaiian Islands, they hope to discover one of the legendary 3-foot-tall creatures. With the assistance of family and friends, the team is investigating sightings along the Appalachian Trail. With a possible squatch in their midst, the group descends on a location along the trail, hoping for an exciting night. Coercive evidence brings the crew back to a surprisingly squatchy New Jersey; Cliff leaves the group to squatch with Bobcat Goldthwait. Finding Bigfoot is currently available to watch free on Animal Planet, FandangoNow and stream on Animal Planet. 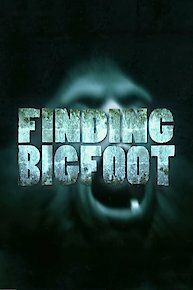 You can also stream, download, buy, rent Finding Bigfoot on demand at Amazon Prime, Amazon, Vudu, Google Play, DIRECTV NOW, iTunes online.